Offshore HVDC platforms DolWin alpha, BorWin alpha and DolWin beta in the German section of the North Sea have been fully inspected by Den Helder-based Bluestream, provider of innovative inspection services for the offshore oil, gas and wind industry. Bluestream’s ability to deliver multidisciplinary services was key in the awarding of these orders as divers, ROVs, multi skilled rope access teams as well as ultramodern drones were used for carrying out all three inspections. “One of the reasons why Bluestream was tasked with carrying out this extensive inspection work, was the technical efficiency with which we approached each project,” explains Commercial Manager Anton Janssens. After successful completion of this first inspection Bluestream was awarded an order to inspect all accessible areas on the HVDC platform BorWin alpha as well. The total height of the BorWin Alpha is 84 metres, of which 62 metres consists of the support jacket. Unlike the DolWin alpha project, this inspection was carried out following a painting programme, leading to a shorter inspection period. The CP Drop Cell method was again used for this project. The extra challenge on this occasion lay in the fact that the legs of this platform were at an angle, as compared with the legs of the DolWin alpha, which run straight up and down. Nonetheless, the Bluestream team found a smart solution to this problem. In mid-2017, Bluestream received a further order to inspect the DolWin beta. This submersible floating platform is moored just 30 metres from the DolWin alpha. The concept behind this platform is different from that of the previous two platforms, which are mounted on separately installed jackets. The six legs of the DolWin beta are in fact an integral part of the platform itself. Bluestream was asked to carry out a general visual inspection using a drone operated by business partner Skeye, based in Alphen aan den Rijn. In just three days, pilots from Skeye inspected the outside sheeting, the legs and the underside of the deck of the DolWin beta platform using a drone. 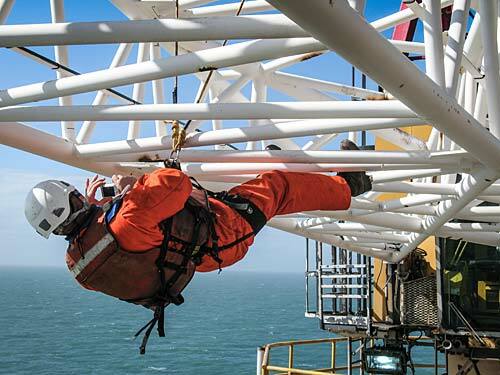 A small part of the inspection work still had to be carried out by one of Bluestream’s rope access teams. After all, there are always certain areas that require a close visual inspection. Drones are a complementary tool, and will never be able to completely replace rope access. The awarding of a fourth order is evidence that Bluestream has stood out with the use of innovative inspection services over the past year. In September of this year, Bluestream will be returning to the BorWin alpha for an extensive inspection of all components of the platform, both above the water and subsea. This time the work will not be carried out by drone but by rope access, backed up by ROVs. None of this represents a problem to Bluestream, since the company can offer all these services in house.